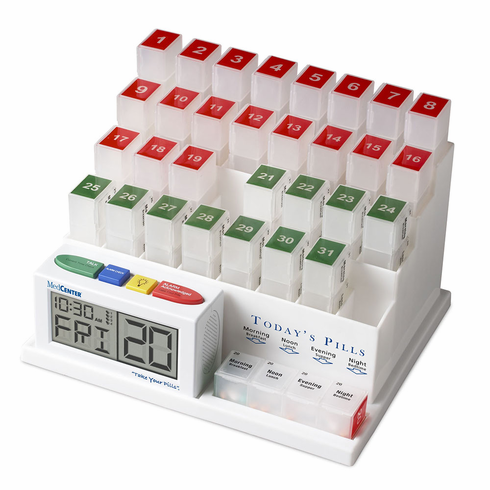 Never Forget to Take your Medications Again with the e-pill Medcenter Monthly Organizer and Pill Timer. Never forget to take your medications again with the e-pill Medcenter monthly organizer and pill timer. Organize a month worth of pills into 31 daily compartments up to 4 daily doses (morning, noon, evening, night). Always remember when to take medications with the handy voice reminder that sounds a persistent alarm until the user presses the red acknowledgment button. The red and green indicators on the top and bottom of pill containers provide added peace of mind that pills were taken. Capacity: Holds 20 Aspirin sized tablets per Dose.